Today’s workforce reflects many cross generations working together. These include: The Silent Generation (1925-1945), Baby Boomers (1946-1964), Generation X (1965-1976), Millennials (1977-1995), and Generation Z (1996 and later). While each of these groups bring beneficial skills to the workplace, there tends to be differences in workforce behaviours between the oldest and the youngest generations, particularly the Baby Boomers and Millennials. Despite age gaps between co-workers, a multigenerational workforce is a great way for employees within a company to educate and learn from each other. Older and younger generations may have different views from growing up throughout different time periods, but both bring respected opinions and experiences to the workplace. Mentorship between older and younger generations is an effective way to have both groups work together and communicate openly. Age diversity in the workplace allows for all employees to express and share their valued generational traits with each other. Differences in characteristics between the older (Baby Boomers) and younger (Millennials) groups in the professional world should be a positive and rewarding experience to ensure a happy and productive working environment. Consider the following lessons to be learned from generational diversity in the workplace. Time Management: Ascertaining an effective time management method comes with maturity and experience in the career world. The older generations in the workforce have learned the essential attribute of how to delegate, schedule, and prioritize. These insights can be passed down to young eager employees who are possibly struggling to balance their work, family, and social lives. It also provides the opportunity for older workers to understand the new challenges their younger peers are facing. Financial Stability: Younger people in the workforce are beginning to make big first-time purchases such as a car or an apartment. Older workers can share their insight about managing self-control and spending, and how everyday financial choices should be taken seriously. They can express the benefits and consequences of present actions and how they can determine future stability. Loyalty: The younger generation has made “job hopping” a norm by only staying at companies for an average of approximately three years. In contrast, older generations are recognized as being more loyal to their employers and staying for longer periods of time. They can express the benefits of remaining at a company and building a career as well as the potential downsides of transitioning from job to job. Technology: Whether it is a device, software program, social media, or code, the chances are high that a “tech-savvy millennial” will be able to use it. If they are unsure, they can quickly adapt and are happy to share their knowledge with coworkers who might find new technology challenging. Their skills can be utilized to create a better opportunity to market, sell, or advertise a company’s products/services. Openminded: Younger generations have been raised and exposed to a more diverse and collaborative community. They often have a “broad mindset” that can open the eyes of older workers. This also applies to being excited about the future and believing that life does not have to be meticulously planned out. Life is a process of discovery and everyone should be open to new experiences and processes. Millennials tend to have a “figure out what you want and do it” attitude towards fulfilling their dreams. Entrepreneurial Spirit: Baby Boomers were taught that hierarchy is to be taken seriously and often refrain from giving input because of their status. The younger generations are encouraging more collaborative work relationships between management levels. Regardless of their titles and positions, they want to express their opinions and contribute their skills to the company. This bold mindset and initiative can be a lesson for older workers. Having multiple generations in the workplace poses an advantage and creates a professional environment filled with experience and maturity, as well as a youthful eagerness. Workforces that reflect age diversity provide an endless amount of skills that ultimately benefit their employer. Companies need to retain their talented employees as they are a vital part of the businesses’ future success. Canadian organizations want to find and foster the best employees to build a team of all-star talent, regardless of age. Hiring the right employees is a key factor to ensure business growth and competitiveness. To help with this task, Mentor Works has created the How to Find and Recruit Top Talent Slide Deck, which shares the most effective job boards for posting open positions. 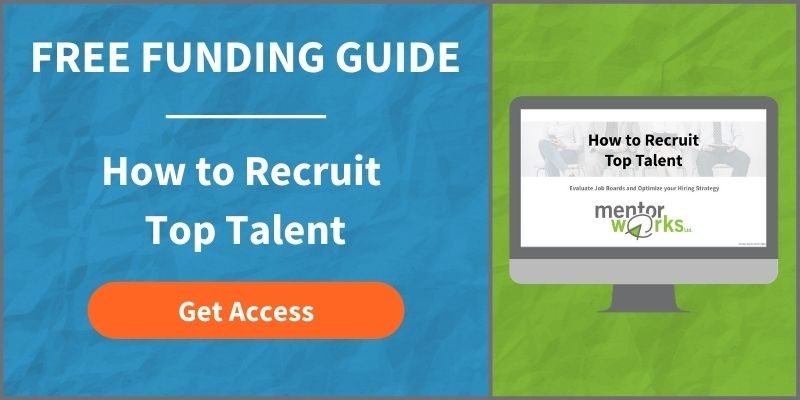 Download the How to Find and Recruit Top Talent Slide Deck. Posted: May 17, 2018 by Myra Bredin. Updated: May 17, 2018 by Myra Bredin.